Yesterday I set up a conference followup group on UnionBook. This group will allow people to post links, documents, and so, to hold discussions — to do everything one would want to do after a conference. I’ve only informed some key people about it so far (8 of whom are now members), but plan to promote it more heavily later this week once we have all the email addresses of conference participants. Let’s use this group as a test to see if we can get UnionBook to be useful. At the LabourStart correspondents meeting last Sunday in Hamilton, someone suggested we look into BuddyPress as an alternative to Elgg. It looks interesting, but I’m not convinced we have good reason to migrate (even if we can migrate). So I’ve put it out there via UnionBook, Facebook, Twitter, etc and will see if someone thinks this is a great idea and can make a compelling case for it. I closed down the Iraq oil workers campaign in all languages – it had been running for more than 3 months. I’ve setup the Serbian edition of LabourStart, and am currently working with a comrade there to get it off the ground. Last Friday I recorded my sixth podcast, this time on the subject of hashtags and how they were used at the LabourStart conference. As of this afternoon, 376 people have downloaded it and listened to it. I also wrote up an account of the conference and posted it to my blog. Then I updated the conference page to include links to my article and the podcast relating to it. I sent out mass mailing promoting our book of the month, my podcast, two articles about the conference and our ActNOW newswire. As a result of this, we sold a few books and got a couple more sites to adopt our newwire. Meanwhile, today I’ll add some odds and ends about stuff I’m doing as I do it. UnionBook: Just launched a $150 Google adwords campaign — this money is a gift from Google, so we should use it. UnionBook has been growing slowly but surely over the last few weeks and this may give it a boost. Also publicized UnionBook in my daily wire post/tweet/Facebook update. Book of the month: We’re promoting this starting today. Campaigns: Have asked permission to close down the Iraqi oil unions campaign, which has been running for more than three months. Internationalization: We have a volunteer in Serbia who is keen to help us get our Serbian language edition off the ground; today I sent him the file for translation. Conference followup: I’ve added links to articles about the conference, videos, photos and Tweets here. 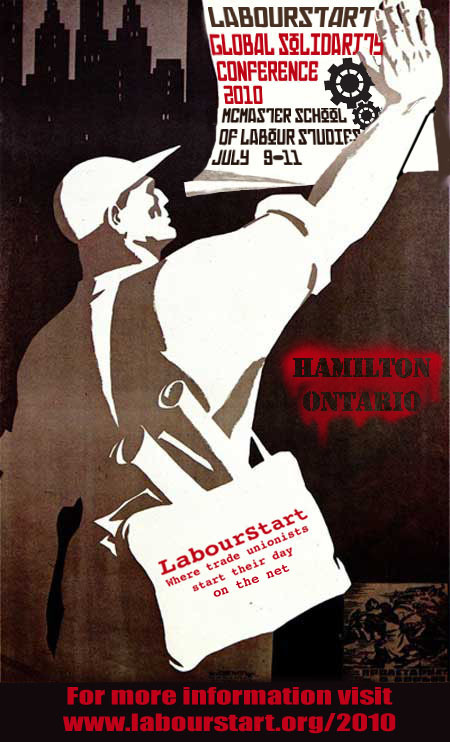 Also removed the ads for the conference from the front page of LabourStart and UnionBook, and from the LabourStart correspondents sign in page. Our conference is now 3 days away. We have 292 registrants (up 34 in the last week) of whom 103 have paid their fees (up 9 in the last week) — for a total of C$14,572. The conference website is located here. There’s been frenetic activity on both sides of the Atlantic as we do final preparations for the LabourStart conference which opens on Friday this week. Visa issues, last minute cancellations, last minute registrations, the sudden discovery that we forgot to tell everyone something absolutely vital … it’s been fun. What this means for those of you reading this is that don’t expect much in the way of answers to emails, or solving of problems, over the next week or so. We’re going to be completely immersed in this until I’m back in London on the 13th. I also urge everyone to refrain from sending emails to me unless they are extremely urgent during this period as I expect to be overwhelmed with conference-related emails and will be able to read or respond to most others. Thanks for your understanding. I’ve done a few tweaks to the proposed agenda for our correspondents meeting in July at the end of LabourStart’s Global Solidarity Conference. Please have a look and send me any changes you’d like made. Thanks. How many correspondents are active? We have a new tool that shows us not only who’s been active today, but adds which correspondents have posted news in any language this month. It reveals that 89 of our 761 correspondents were active this month, and of those, 20 post on average at least one story every day. Of those 20 correspondents, at least 8 are expected to attend our conference in July. I intend to follow up to try identify who are the inactive correspondents and to write to all of them to see if we can help (some will have lost their passwords, or forgotten how to post stories). I will also encourage the most active correspondents to consider attending the conference.